Miro for Mac is a free and open-source music player, video player, converter, and torrent downloader. It can sync to Android phones and tablets and other devices. Buy music and apps from Amazon and Google right in the app. 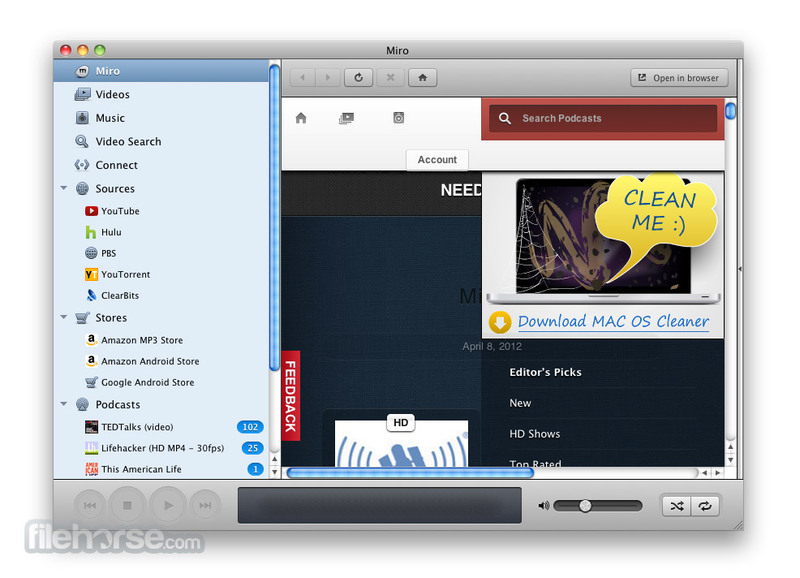 Miro Video Player is a free alternative to iTunes with more flexibility. It's very easy to switch from iTunes to Miro -- without any copying. Just point Miro to your music and video folders and those files will appear. If you don't like Miro (impossible! ), nothing's changed. You'd have to be crazy to use a music player that doesn't sync to your phone. Miro is simply the best music and video player for Android phones and tablets. The Amazon MP3 store is built-in to Miro. Buy, download, and listen, seamlessly. Buy Android apps from the Amazon or Google app stores and they will sync to your device. Do you still use separate programs to download, play music, play videos, and sync to your phone? Miro plays almost any video or music format and downloads from YouTube, podcasts, Amazon, and bittorrent. You can convert almost any video with Miro into mp4/h264, with presets for almost any device you can think of (including iPhones, iPods, iPads, Android phones, and more). When two Miro's are on the same wifi network, they can stream and transfer music and videos to each other. It's the easiest way to watch a video or play music upstairs if the file is downstairs. 7. Open-source - don't lock yourself in! Unlike some other media players (cough, cough), Miro is not trying to run your life! Not only is Miro 100% free and open-source, it's made by a non-profit organization. You don't need to be locked down by one corporation to have a great media experience. Miro has some of the fastest bittorrent downloading in the world, built in. Try us head-to-head with any bittorrent application! 9. But it's not about the features! Miro has a lot of features, but that's not what matters-- it's the experience. Miro for Mac is a simple, beautiful, unified way to download, organize, and watch videos and listen to music. And it's totally free.